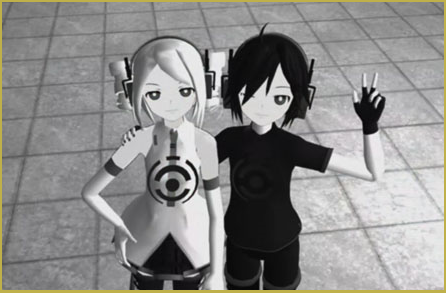 As practically everything I do in MMD, it’s a Portal based story. 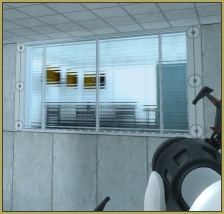 This time, main characters are Aperture Science Sentry Turrets: a regular one (white) and a defective one (black). In game, they’re just minor adversaries (well, the regular ones are; the defective ones are more of a comic relief), but thanks to their distinct personalities, fans dig them: make pictures and videos with them, humanize them (well, for any MMDer that’s not something new; can anybody say “Kantai Collection”? ), cosplay them… and occasionally ship them. This video, essentially, is just one of those “shippings”, a classical boy-meets-girl story… only that… this is Aperture. During the course of Portal 2 game, we eventually visit the “turret factory” area, where turrets are manufactured, assembled, tested in a gunfire range, and then scanned against a reference model. Those that fail the evaluation are sent to the incinerator. Final parts of the video are modeled after that part of the game. And so, there was one day that I was listening to the playlist of favorites in my phone, and the “Bang Bang” from Kill Bill got summoned by the random numbers generator, and the line “he was black, and I was white” sounded in its own turn… and suddenly it occurred to me that it might be about these two turrets… and the song went on, and pieces of the picture kept clicking flawlessly one next to another… and to the moment it was over, the whole story was in my head, from the beginning to the end — the story of two souls living in an enclosed microcosm of Aperture Science, where nothing beyond this tiny universe ever exists to its inhabitants; the story of an unexpected friendship in a place where friendly voice usually means death and where caring is not a part of any test protocol; the story of a weird bonding between those whose only intended purpose was to aim and kill… the story with a sad ending, because, in Aperture, that’s the only approved kind. I knew it was a story I *wanted* to tell, I knew that I’ll never forgive myself if I don’t, and, fortunately, I felt that unlike some *other* ideas for videos that I had, ideas that would require animation skills far higher than I’ll ever be able to muster, this one could be quite doable and even rather easy. In fact, if I don’t waste too much time, I might finish it yet before Christmas. …That was two years ago. Classical planning fallacy. Of course, since it was not just a random music video, but a *story*, I was naturally limited in my choice of models. I couldn’t just select between Rin and Teto based on which girl I like more, or replace Neru for IA because of a better TDA rendition available. I needed a Portal Turret model… and making one myself wasn’t an option. While I know about processes and tools involved in models’ creation, and with a right amount of diligence probably would be able to assemble something that doesn’t crumble in 10 seconds… my imagination doesn’t work in a way that allows to *visualize* a model that doesn’t exist yet. I had to work with what I had. 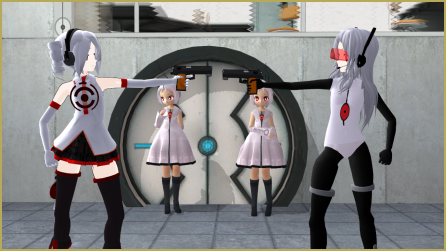 It’s not that Portal franchise is overlooked by MMD makers. 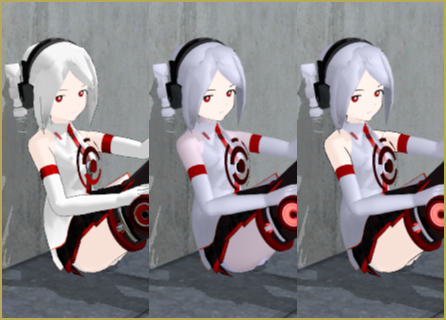 There are lots of Chell models for every taste, and quite a few of decent GLaDOS versions… Turrets, though, are somewhat less numerous. In fact, after sifting out blatantly newcomer’ish attempts at modeling, WIPs that looked promising on pictures but never got released (or possibly were deleted before I ever had a chance), and stuff I plainly didn’t like, there were exactly two(*) Turret models worth attention: the one by The-Mystery-Raccoon (unfortunately, she moved to a new dA account since then, and all her previous works got winked out of existence, so I can’t give you a link to the original model), and another by UxieBunny (the account is still there, but the model page is no longer available either). *Well, that’s not quite fair. Turret-tan by xCarmle was quite good, just far too immature for the story *I* had in mind (Youtube video with the link taken down… is it a curse or what? no idea if the model is still available anywhere). Also, looking back at dA now, I see a couple more models that *could* make it, but I saw them too late. Let the best turret win! UxieBunny’s version was a completely original design… well, can it be said about a model that fully relies on a clothes-less LAT base? But it *had* an original look (I had the model stashed for years on my HDD, and only realized the secret just now), and was definitely turret-y. The-Mysterious-Raccoon’s, on the other hand, was obviously a LAT Miku close relative, up to that damned stupid ribbon at her side… well, maybe as a part of original Miku trademark image it was nice and dandy, but after you’ve seen GLaDOS, Turret, Personality Cores’ girl band, Companion Cube, *and* Portal Gun impersonating models in nearly identical white dresses (*more* than one variant of each, for that matter), one can get abrasive. But this one had a matching Defective Turret counterpart, and that was a decider. The *only* worthy Defective model in the first place (apparently, UxieBunny had worked on one too, but it got lost even earlier), and these two looked much more natural next to each other, than if I tried to pair models taken from different authors. So the choice was made. OK, the above paragraph sounded like I was forced to choose against my better judgment. That’s not true. In fact, their looks was quite alright. Once I got used to them, it was no effort imagining them through the whole plot of the video (now it’s hard to imagine anybody *else* there). There were just two adjustments in the visual department that I felt necessary to make: one was removing the said ribbon – that, to me, was drawing a line between a bubbly carefree anime girl most MMD models are, and a reserved, close-lipped gunslinger I wanted. Another was Defective’s black half-gloves – whenever I’d imagine him performing various scenes in my mind, somehow they always were on his hands, so in the end I just went and added them to the model. Aside SemiStandardBones plugin treatment, both models maintain two additional forks made by IKMakerX plugin. One has hand IK bones parented to UpperBody bone (in shootout scenes, these make recoil quite easy), another has them parented to the motherbone (for scenes where a palm should rest on some surface, while the torso moves around). Warning: try to make it the LAST thing you do to your models. Whatever other changes you expect to do, think of them before making forks. If something comes up later, you’ll either have to apply it to every fork, or re-apply IKMakerX to the base model again; both ways are dirty mess. Standard LAT facials turned to be not enough to emulate all expressions I needed, so there were several additional morphs: a brow twist, a half-grin, several versions of a sneer, unnaturally wide eyes. Compared to originals, these are much less smooth, but they were good enough for me. Materials’ Diffuse/Ambient/Specular settings had to be reevaluated to get better result from Half-Lambert shader. Also some texture-less materials were given textures for the same purpose (with the default lighting, there’s no noticeable difference). There are various opinions on model editing. There are many authors who ask you not to distribute your edits of their models; there are some who do not want you to edit them at all. 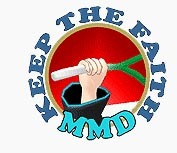 If you’re a good MMDer, you will respect these wishes, even if their legality (and common sense) may be sometimes dubious. But if the original model does not provide you with *functionality* that you need in order to make it work like you want to — all rules are off. Did I say before that the Portal universe is well-covered in MMD? That certainly goes for models… but not for stages, though. In fact, I only can remember two dA entries based on that theme — Vocaloid Lab Stage and a simple square chamber included in the GLaDOS Model Ensemble (both by Trackdancer); for mainstream MMD song-and-dance works they are reasonably good (plus, the Lab Stage is sometimes used by MMDers for Portal-themed stuff; I use a recolored version of it myself when I want to make something quick)… but even as I was working on my first video, I realized that I don’t *want* to use pre-made dance stages — the story that takes place in Aperture Science must be using environment that looks like authentic Aperture Science test chambers, and if I wanted some, I must make them myself. The video consists of several scenes (filmed separately and sewed together in AviDemux). Each of them, in rough terms, uses two types of components: hand-made wall blocks filled with textures extracted from game files and fully ripped models of various devices, furnitures and adornments that can be seen in games. Every scene was constructed straight in MMD – much easier to change something on the fly if you suddenly get a better idea. All in all, there were eleven various scenes (some used in more than one episode). Even though the Blender addon combination that I used for model conversion translates their bone structure well enough (so the whole painstaking weighting job is usually cut-out for me), sometimes those models require a lot of additional rigging before they could be used in MMD. Some of stuff I adapted can be found on my DeviantArt page. One of more elaborated stage elements that I made was an Observation Room. Almost every test chamber in Portal contains one or more room hiding behind the semi-transparent prismatic glass from which scientists could supposedly watch test subjects’ progress. There were no such a room readily available (or easily converted) in game files; yet I knew that such a thing would greatly improve the authenticity of my chamber’s looks. I also knew that I’d want to use such an element a lot, once it was made. So, while I usually place solitary models and wall stage elements separately into MMD, in this case I revved my PMXE and assembled a whole room with lots of various furniture pieces. Each piece had its own freely moving bone, and even walls themselves could be moved, making the room wider or smaller; yet, the whole of it is united under one bone to rule them all, allowing to drag the room in an MMD stage as a single unit. So the room turned up highly reusable, just as I wanted. Thanks to Bandages, who provided the refraction script for MME, it even came with its own rifled front glass! One of reasons that the work took so much time to finish (*aside* from my laziness in the first place, that is :D) was that it took many reworkings of what’s already done. Once you learn to do something in a better way, you naturally wish to *make* it better… and sometimes the price may rise high. One of such cases was about making those chambers. While working on my first video, I was almost completely relying on models and walls made by dA user skaa3w (another one that is gone with all his downloads… sic transit gloria friggin’ mundi) with a small portion of models rigged by other people. Even though I did modify some of walls in order to make portals in them, and sometimes would merge pieces of wall to get larger surfaces to operate, the base was still his. At first, starting this project, I tried to use them as well, but this time I wanted more variety in textures, which turned to be rather hard, since he used his own recompositioned versions of textures to make his wall blocks, and adopting other textures to the same scheme would take a lot of work. Plus, I eventually came to the idea of a common size denominator for all used elements — 25 width/height units for a square piece of wall (the average MMD model’s height is about 20), which gives 100×50 size for an eight-pack, and a 0.1928 multiplier for all models imported from Blender. Using these numbers would give me well-proportioned environment in which MMD models would fit quite well, whereas skaa3w’s models were scaled quite arbitrarily, and without a unifying scheme (that, and the fact that they were imported into .pmd’s without bones and logical material separation. Those that had moving parts were rigged *and* weighted by hand, and sometimes rather sloppily, so I usually had to re-rig them by myself). As I progressed futher, trying to reconcile old and new stuff under the same project’s hood was turning to be more and more excruciating… until one day I gathered all my resolve and decided to scrap all traces of skaa3w’s stuff from all stages I did so far, and rebuild them from scratch only using models and walls I imported myself. The overhaul took a lot of work, but it paid in the end. The difference between original and rescaled textures could be seen by a naked eye, for starters. Once in a while, I feel seriously tempted to remake The Device Has Been Modified using all the stuff I learned and acquired since those early days. Does anybody know where to get another 48 hours a day, by the way? As far as lighting goes, I’m a steadfast Half-Lambert fan. Illuminating the room with light sources that are actually *there* instead of using non-centralized default MMD light allows for much more “live” environments. At the beginning (and at the end) of the video, pay attention to the flickering signage panel on the right side. The panel itself flickers by changing its texture, but it also illuminates the patch of ground next to it. During shooting scenes, muzzle flashes also reflect from Turrets’ bodies. In the “turret scanner booth” scene, the moving shadow suggests that some distant light source had moved. While the shadow itself is a genuine MMD one, the gradient of light in room’s lit areas simultaneously changes as well – that’s Half-Lambert in action. A little more peculiar usage of the shader can be seen in the “pinfinger game” scene. If you look at the far wall behind characters, you’ll notice flickering light on it, as if a fire is roaring under the grate on the floor. That, of course, is another Half-Lambert light source illuminating the wall (also the SoftSmoke effect was placed there to enhance the impression of flames). I didn’t want to animate the whole length of the scene to do the flickering, though (all right, I could animate just one second of it and copy-paste the rest, but that’s still boring. And not random enough). Is there another way to do it? Sure! Remember those models with convulsing physics? These actually gave me an idea. I took a model with long hair, placed her under the grate (and positioning a model below ground level makes all their physic bones run absolutely amok), and attached a light source to the tip of her hair (with x+5 shift, for good measure). There, one flickering light at no cost! Unfortunately, with models it was not going to be that spectacular. They were both LAT, and as you know, LAT models do not live well with shaders. Sure, you can subset-extract the model in the Effect Mapping panel and remove the shader just from face and nose, as many tutorials recommend… but when I did that, the result was not very reassuring – the contrast between shaded body and non-shaded face was too bizarre. I was seriously considering leaving actor models without my favorite tool… but then one day I got the idea to try and remove the shader not just from face, but from *all* unclothed skin parts. Surprisingly, the compromise turned out much more acceptable. Word of caution: you *can* use Half-Lambert in the same scene with AutoLuminous, if you really want… it just will be bloody hard. It will take a lot of maneuvering in Effect Manipulating panel to remove shining from parts that aren’t supposed to shine and that would cause no problems if you just used those effects separately. In the feedback I got, more than few people particularly mentioned the shell-flipping episode. For this video, I made a specially rigged shell — it has rotation points at the base, in the middle, in the center of the bullet, and in the bullet tip, and the material is weighted to the last bone in the chain. That allows to give the same model various kinds of movement. Of course, if you try to combine several rotations in the same motion sequence, you may find that the rotation center you need at the particular moment turns to be *outside* the model’s body. You better plan your movement for such collision not to happen… or try and create a more sophisticated rigging :D. Maybe I will some day, if I ever need to spin another bullet. But having a flexibly rotating shell was not enough for a fluid movement. In that scene, I had to actively use models’ OP Setting. As the shell rolls over a knuckle, it also moves along with it, and so it is OP-attached to that knuckle. 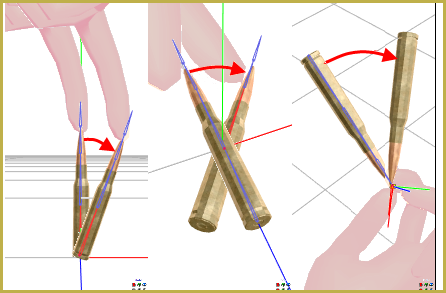 When it rolls to another knuckle (and the former finger uses the time to assume a new position), its root bone operatively switches to *that* knuckle instead. OP’s “Frame register” setting makes the transition look seamless. Even though that scene may look impressive, from the technical standpoint, there’s a more interesting one — it is the moment later, when the Turret throws away the row of shells in frustration. Animating each of them would be painstaking; besides, even with the best attempt at using interpolation curves, the motion would look hardly natural. Instead, I decided to coopt MMD physics engine for help. The shell model got a further upgrade — a physical body. Now those shells just stand there with their physics turned off, and at the necessary moment physics kicks in. At first I was experimenting with them just to be beaten by Turret’s hand body itself, but that one would not catch them all; besides, the timing of the hit was extremely fragile — miss the moment by a fraction of a frame, and all shells fall down instead of connecting with the arm. So in the end I just created a wide invisible physical wall that sweeps them from the floor when necessary.